Shoreside Enterprises recalling 7K and Poseidon 4500 supplements containing undeclared Sildenafil and/or Tadalafil, which are are active ingredients in two FDA-approved prescription drugs used for the treatment of erectile dysfunction. The presence of Sildenafil and Tadalafil, which are not declared on the label, renders them unapproved drugs for which safety and efficacy have not been established and -- therefore -- subject to recall. 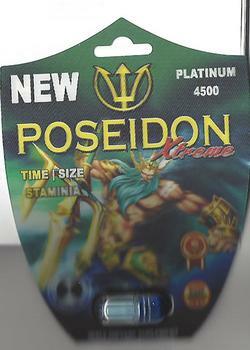 The recalled products, marketed as dietary supplements for male sexual enhancement, can be identified by their blue color, and lot numbers located on their individual packaging Poseidon 4500 Extreme 1000 Lot #20117BL, and 7k Lot #RO. They are packaged in one (1) capsule blister pack sand sold by Shoreside Enterprises from February 2, 2017, to December 19, 2017, by retail locations in Illinois, Ohio, North Carolina, Massachusetts and Florida. Customers who purchased the recalled products should stop consumption and return them to place of purchase or directly to Shoreside Enterprises 6345 Newtown Circle A-3, Tampa, FL 33615 for a full refund. Consumers with questions regarding this recall may contact Shoreside Enterprises at 727-236- 0576), Monday – Friday, 09:00am – 5:00pm (ET).